So this site will be dedicated to documenting development progress of these sticks and functioning as a hub for the project. The whole thing started with a thread I posted over on the Nintendo64 Forever Forums back in February. From there things kind of exploded and more recently I’ve only had time to post occasional update snippets to twitter. As a result details in the original thread are in need of an update and with the project moving on a bit I figured it was time I got a site up and have everything organized in one place for easier oversight. The interest and enthusiasm for what I’m doing has been simply amazing to see and has kept me motivated to keep working on this project. Naturally from the beginning everyone had a lot of questions about the sticks. “Would they be available to buy?” “When?” “How to get one?” “How much?” “Are they any good?” etc. Generally these were good questions that I didn’t have good answers for and I simply resorted to parking everyone on a waiting list while I kept working on the sticks and figuring it all out. What I was clear on from the beginning was that I needed to get these sticks into the hands of top speedrunners and competitive N64 players to really figure out how they play and hold up. I wanted to take my time with testing and development to make sure I could deliver something really good. The last 6 months has been a rollercoaster of emotions seeing my prototypes put to the test on various speedrun streams or in major Smash64 tournaments. My testers have been amazing at offering feedback and based on that invaluable interaction I’ve been able to incorporate many refinements and improvements along the way. I realize everyone is incredibly eager to know what’s going on and hopefully with this site going up I can fill in some of the (many) blanks. On my end I’ve been super busy working out the various production processes and refurb steps required to build these sticks efficiently. There are quite a few machining and finishing steps that go into making a stick and a lot to get right. Building a few prototypes with tolerances all over the shop and plenty of guesswork is one thing. Having a well thought through and above all consistent method for making all the parts, not to mention assembly and testing, is quite another. All that said I’m getting there slowly but surely and am now happy to start getting some more sticks out there to people! I’m calling the next step the “Early Adopter Stage” so hop on over HERE for an explanation of what that entails. Below on this page you’ll find the general “pitch” for what Steelsticks64 is all about and a summary of the latest state of the project. I’ll be adding more in-depth posts to the Dev Blog section going forward so keep an eye out for that. Also check out the FAQ for an answer to some of the more common questions I get asked. 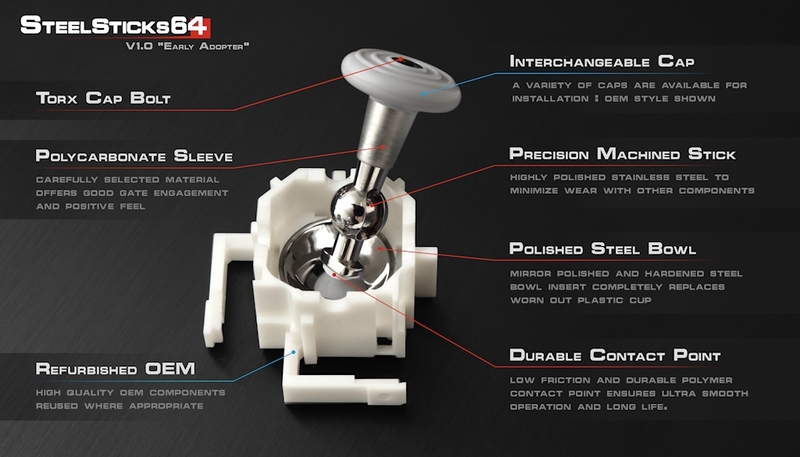 Steelsticks64 is my attempt at building the ultimate joystick replacement for the aging but still awesome Nintendo 64 controller. A couple of years ago I was delighted to come across the retro speedrunning community and was immediately hooked on watching players push 20 year old N64 games to the limit using original hardware. More recently I’ve been introduced to the Smash64 competitive scene and it’s fantastic to see the level of passion still associated with this console and controller after so many years! Recreating the original parts in higher quality materials has been something I wanted to attempt for a long while and this was the kick I needed to give it a go. I’m a big fan of the original joystick (provide it’s in decent shape!) and wanted to keep what makes it unique and awesome while eliminating some of it’s major weaknesses. I’m still actively working on developing and testing these sticks so some of the following is likely to change. Should however give a good overview of where I’m at currently. 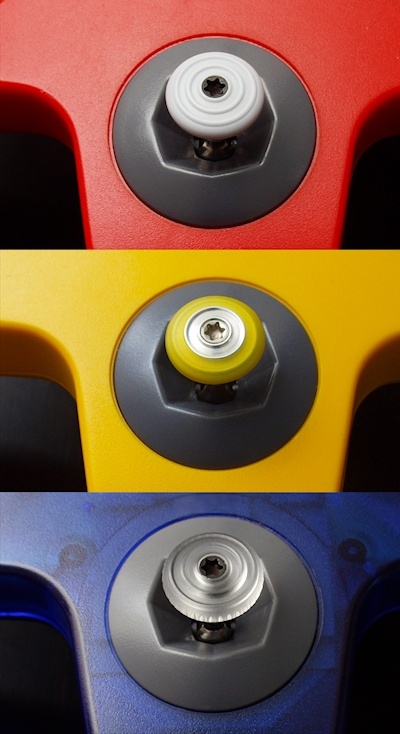 First of all it’s important to state that these joysticks are extensive refurbs rather than an entirely new design. I am a big fan of the genuine N64 joystick so I’ve taken the module for what it is and tried to replace or improve key components within it. Following the saying “If it aint broke, don’t fix it.” I refurbish and reuse OEM parts wherever possible. Starting with worn out joystick modules I part them out, clean everything thoroughly, sort the parts by what is still usable for my process and then go from there. Important to me is maintaining the performance and input behaviour of a genuine stick as much as possible. There are plenty of ok aftermarket options out there already if you find compromise in this area acceptable. I think it’s fair to say that the fatal flaw at the heart of the N64 joystick design is the bowl itself. Extended grinding of the plastic stick against the bowl literally turns it into dust. As a result the stick drops down into the mechanism, the spherical section loses it’s tight fit to the case and the input range of the stick drops off drastically. Everything gradually becomes looser, harder to move and no longer feels right. There are other problems with general plastic on plastic wear, but with a good bowl keeping the stick exactly where it should be those are secondary concerns. In my stick the Bowl is precisely machined out of steel and highly polished to offer a solid and ultra smooth foundation for the rest of the components. The steel part itself is a solid chunk of metal that completely replaces the center section of the bowl component. Prototype bowls worked great in testing and were made from relatively soft low carbon steel. Going forward these parts will be either made from quench hardened toolsteel or heat treated stainless (still investigating the processes and pros/cons for these two options) to make sure they stay pristine over long use. 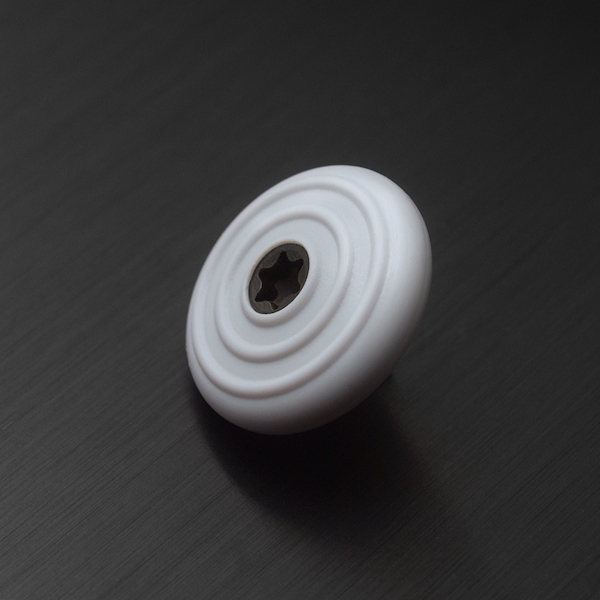 The white plastic part of the component is made from a genuine OEM part. 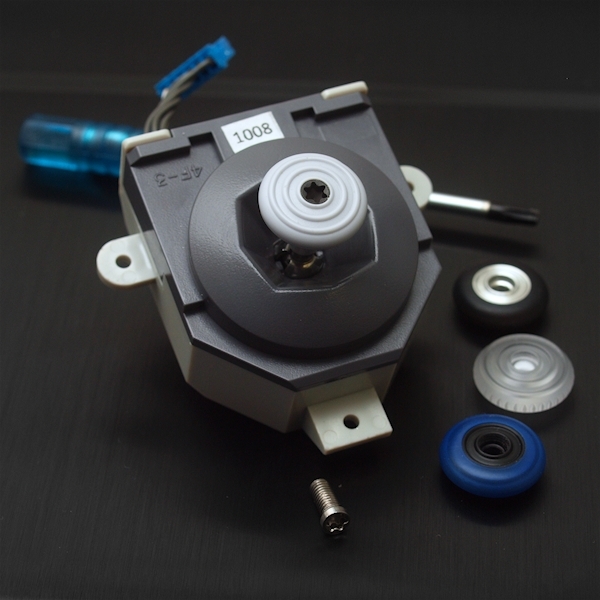 As a result it is highly precise and allows excellent smooth running of the optical encoder wheels. This is a critical part to getting a nice and smooth feel to the stick. As the name of this whole project implies, the stick itself is machined out of stainless steel and highly polished to minimize wear with the other components. Material choice for this part is also something that has changed numerous times since I built the first few prototypes. The aim currently is to be able to offer a fully heat-treated stainless steel part for maximum durability. While the core component is made of metal the design incorporates a tapered polycarbonate sleeve at the top of the stick and a small polymer insert at the base. The sleeve helps reduce weight and offers a positive engagement feel when the stick is in contact with the octagonal gate. The small polymer insert at the base is what actually touches the bowl. As a result there is no direct metal on metal contact which should result in a low friction and low wear interface. The modular tip design also means that this part can be easily replaced, height modified (for fine-tuning stick response) or upgraded as needed. I like to tinker with things like this so I think that’s pretty cool. I’m still experimenting with various materials for the tip and right now I’m drifting towards a switch to Acetal (POM-C) for better form stability under prolonged pressure and potentially better wear resistance with only a small increase in friction. That said all prototype sticks out in the wild used a Teflon (PTFE) nib. 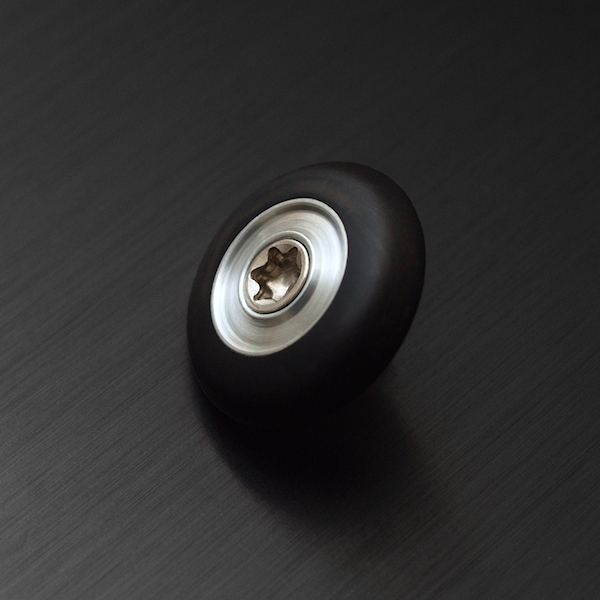 These materials in combination with the polished steel bowl gives the stick an exceptionally smooth feel. If anything, testing has shown the extra smoothness of the teflon nibs takes a bit of gettting used to when compared with the relatively high friction OEM components. 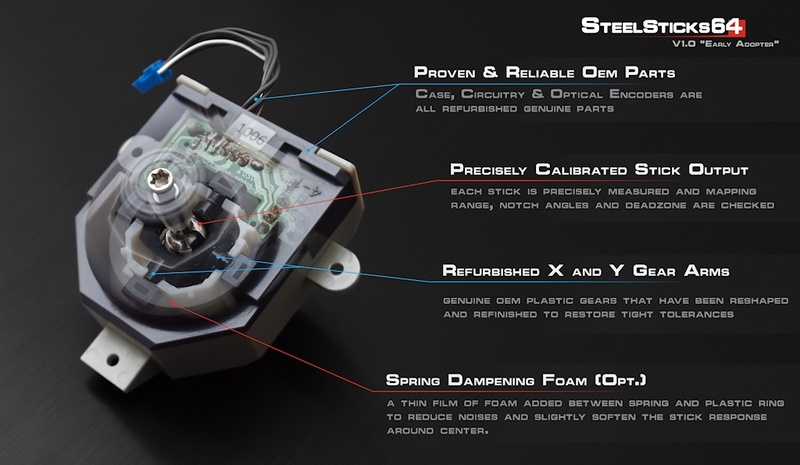 The black X and Y gear arms which drive the encoder wheels are critical to the smooth and precise operation of the stick, if something is too loose, binding or not moving smoothly here you’re going to feel it directly in the stick response. To achieve the high standards I have for how my sticks feel and to attain super low deadzone play there is currently no other option than to refurbish genuine worn parts and bring them back to like-new tolerances. This involves a relatively simple but rather fiddly process of heating and reshaping the arms, then machine finishing them back to the right dimensions. It works and allows me to dial the sticks in to having no/almost no deadzone play when assembled, but this process has caused me more frustration than anything else. There are aftermarket options currently available for these parts but they aren’t precise enough to do the job. They require quite a bit of flash removal and cleanup to approximate the feel of a genuine arm which is time I’d rather spend on bringing a genuine gear back to life. That said check out the great work ENKKO is doing in replicating these parts through injection molding. Hopefully we’ll have access to a good quality, off the shelf gear option in the near future. Fingers Crossed! Here is where it get’s fun! One benefit of having a modular stick design is the opportunity it offers to play around with different styles of cap. As with everything else right now I’m still experimenting with these options but the current plan is to offer the following styles. OEM Style The standard cap included with each Steelstick. 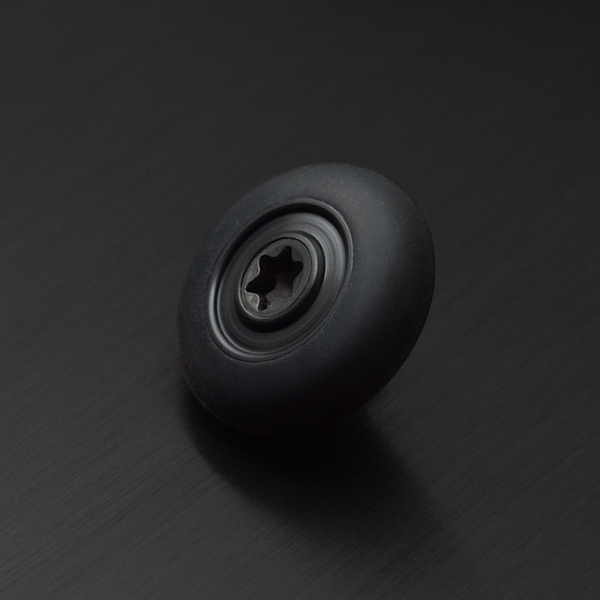 This cap is made from a genuine N64 joystick part and should feel very familiar. Polycarbonate (Beta) A custom “OEM Style” cap machined out of solid polycarbonate and with edge knurling for extra grip. Delrin & Rubber (Beta) A rubber cap variant with a lightweight Delrin core. 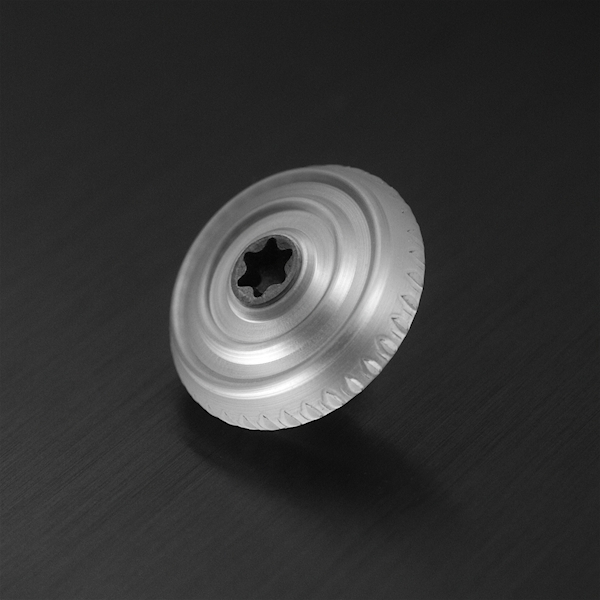 Functionally similar to the Alloy & Rubber cap but with lower mass which may be beneficial in some games requiring quick flick inputs. Potentially more fragile than the solid plastic caps. The rubber sleeve is user replaceable should it get damaged. 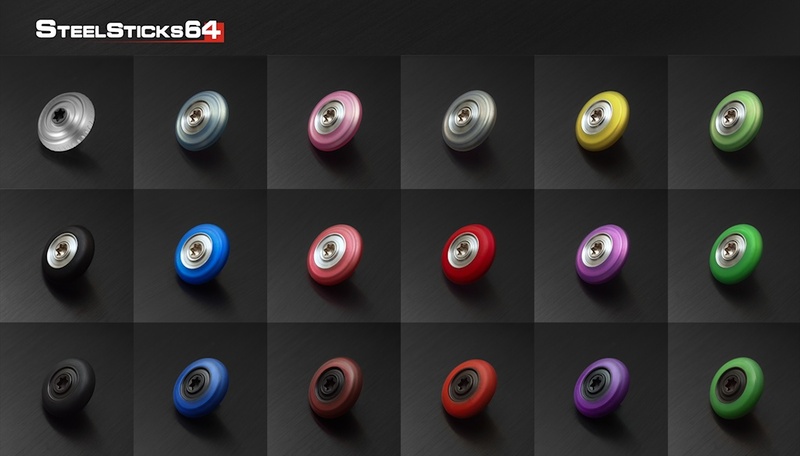 Alloy & Rubber (Beta) A rubber cap variant with a machined Aluminium core, very functional and attractive particularly with the clear rubber colours. Weighs a bit more than stock. Potentially more fragile than the solid plastic caps. The rubber sleeve is user replaceable should it get damaged. A big issue I always had with the OEM stick is how slippery the bare plastic cap can be under certain circumstances. Especially around the smooth circumference. I always struggled for grip and had experimented with various diy rubberizing attempts before starting this project. For the Steelsticks I wanted to fix this issue properly and designed a rubber cap that would finally offer a more comfortable and grippy option for N64 controllers. Of course adding a splash of colour isn’t bad either! That said, outside testing on previous iterations has shown them to be potentially fragile. i.e The sleeve was prone to slip and split if treated really roughly in something like competitive Smash64. The rubber sleeves are designed to be user replaceable should they fail. I have also made improvements on the core design and by sourcing better quality materials which I believe has helped on both issues. Newer versions are currently being tested so we’ll see how they hold up. I’m a big fan of them myself and they look amazing so I’d like to make them available to buy. Durability may still be a concern so I’m making them available with a “Beta” disclaimer. It’s also an area where further “Early Adopter” testing across more than a few test samples and in various play conditions will be very useful. If you don’t want to worry about damaging the rubber style cap but still like the idea of having more grip than stock I’ve also been working on an “OEM style” Clear Polycarbonate cap with edge Knurling. This cap uses OEM style concentric rings but has additional patterning along the edge so a sweaty thumb should be less likely to slip and lose control. The semi transparent/frosted cap also looks pretty cool on various controllers.